The picture has been 'liked' over 21,000 times on Twitter. A picture of a Hyderabad police officer smiling down at the 4-month-old baby boy he rescued from a kidnapping is currently going viral on social media. 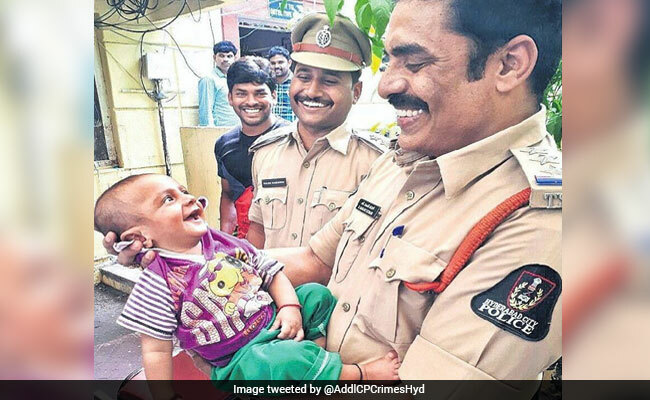 The heartwarming pic shows Inspector R Sanjay Kumar of Nampally Police Station with Faizan Khan, a 4-month-old boy who's grinning ear to ear looking up at him. The picture was tweeted by Hyderabad IPS officer Swati Lakra and has been 'liked' over 21,000 times on the micro blogging website. It has also been retweeted over 5,000 times since being shared on October 7. The four-month-old infant was rescued 15 hours after he was kidnapped on Wednesday night, reports the Indian Express. "Nampally police arrested 2 child kidnappers MD Mustaq & MD Yousuf n Traced 4 months baby boy with in 15 hours and handed over to parents," tweeted Mr Kumar. Cops nabbed the two suspects with the help of CCTV footage and handed the infant back to his mother, Humera Begum, 21, reports the Times of India. "The boy's smile and his mother's tears of joy were worth the team's effort. The boy was crying when he was rescued. He kept crying even after he was handed over to his mother. At that time, I took him in my arms, rocked him gently and he stopped crying. Then he looked at me and gave the widest smile I have ever seen,'' Inspector Sanjay Kumar said to the Indian Express.